Virginia Foltz, 90, passed away on Sunday, January 27, 2019 at Haciendas at Grace Village. Virginia was born in Alma, Illinois, the first daughter of Theodore Relza and Ruby Sullens. While attending college in Carbondale, Illinois, she met and married Harry B. Foltz. Following the advice of Harry’s relatives, she, Harry, and their four-year old son, Randy moved to Las Cruces in 1954. Virginia returned to college part-time to complete her degree in education at NMSU and began her teaching career in 1966 once her daughter Anne was in elementary school. Virginia started as an English teacher at Mayfield High School where she taught until 1979, the year she completed her master’s degree in Educational Administration. She then began administrative work as an assistant principal and then became the first female principal in the district at Mayfield High School in 1985. She retired briefly to care for her husband in 1991. 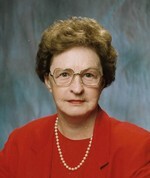 Virginia returned to education in 1994 as a student teacher supervisor for the education department at NMSU. She guided a number of student teachers through the finer points of being passionate, caring, and well-prepared teachers. Virginia took on several difficult tasks for Las Cruces Public Schools including interim positions as principal at Las Cruces High School and superintendent for the District from 2001-2003. She was also very active in the Las Cruces Public Schools Foundation where she traveled to schools throughout the district talking about the need for changes in the tax codes to help fund public education. Her last role for LCPS was an interim Chief Academic Officer in 2005-2006. During her nearly 40-year career in education, she inspired students and educators alike to strive to be better students, better teachers, and the best school administrators they could be. Virginia received numerous awards which reflected her dedication to public education. A great delight in Virginia’s life was travel which took her to all fifty of the United States, Mexico, Europe, and the countries on the Black Sea. She always returned from her journeys filled with a sense of awe and wonder. Virginia was preceded in death by her husband Harry B. Foltz. She is survived by her sister Mary Elizabeth Ruben and her husband Wayne, brother Michael Sullens and his wife Linda, and sister Rita Ballance and her husband Jerry, along with many nieces and nephews. Virginia leaves behind her son Randy and his wife Meg of Moscow, Idaho and her daughter Anne and her husband Lee Bartlett of Las Cruces, not to mention her extended family of fellow educators throughout Las Cruces. A Memorial Service will be held on Friday, February 1, 2019 at 10:00 a.m. at Getz Funeral Home. In lieu of flowers, the family asks that you donate to the Alzheimer’s Association to continue working on a greater understanding of this disease or to Mesilla Valley Hospice.